In the previous post (“How does my personal identity compare to my organisation’s identity?“) I described what elements I think communication about a company’s (or team’s) strategy should include (image below on the left). Now, let’s have a look at how that picture compares with how we normally commuicate about our strategy. 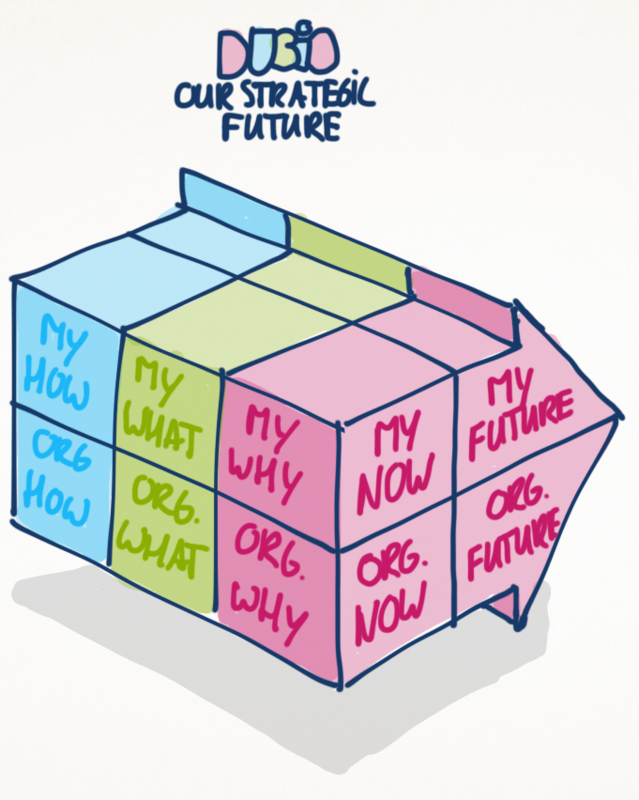 If we assume our strategic communication should make as many connections between the current and future what, how and why of the company and its employees as possible, it will be an interesting excercise to look at what ‘connections’ we usually focus on. 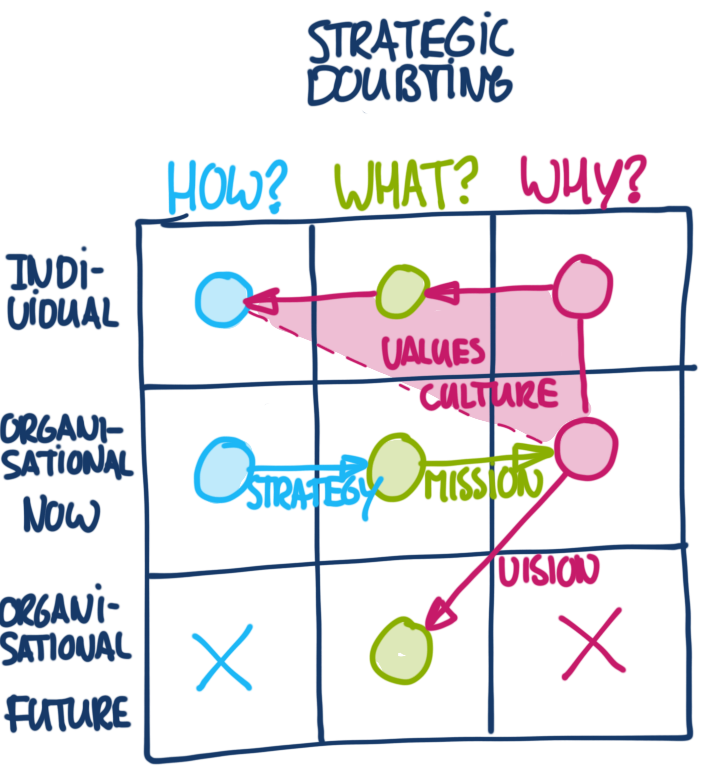 In my post “What does strategic doubting look like“, I had a look at how I think mission, vision etc. compare to the what, how and why (see image below on the right). Now, let’s try to take that a step further. When we communicate about values, or business principles, for me that -ideally- connects the company’s current why (why 3 in image below) and my current why (why 1). I say ‘ideally’, because I think it’s tricky to draft descriptions of values that are more than ‘buzzwords’. It would be interesting to see if we can strengthen this connection, e.g. by investigating what our common beliefs are. Knowing which beliefs I share with the company I work for will give me a feeling that I belong here. That doesn’t mean that we should agree on all beliefs and values, even a discrepancey can motivate me to start a debate about it with colleagues and potentially steer the company towards a differnt why. Ofcourse, the company (read: people in strategic positions) should allow for ‘movements’ like this to grow, otherwise a ‘difference in beliefs’ can lead to unrest. Communicating about our company’s strategy, e.g. in quarterly strategic updates, we usually focus on the strategy in the strictest sense of the word, meaning the choices we made as an organisation, and the plans we made to make it happen. So during those publications or townhall meetings, we only make a connection between our organisation’s current how and what (how 3 and what 3). For the audience of these communications, it can be hard to ‘listen to the why’ of the strategy or to see the personal relevance of it. It requires quite a lot of effort to see how what I do individually contributes to the bigger picture (connecting what 1 and 3). It is hard to align because the organisation’s plans are too high level to link to my personal plans. Somehow, we have to find a way to specify overall choices to my particular situation. However, even if we manage to do that, still something is missing. I’m not sure if in most companies it is common to communicate about the company’s mission, but -if it’s a good one- I think that could be very valuable. I say ‘if it’s a good one’ because there is a risk that companies, especially big ones, focus too much on the how and the what, and ‘reverse engineer’ their why for marketing purposes. Sometimes, the main focus is on measurements of success (e.g. cost-income ratio or profit) and the scope is quite short term (See comment from Eric Sforza on my post “What does strategic doubting look like“). The value of communicating a good mission statement is that it explains why we made the choices that we made as a company. It provides some meaning to what we do. Probably the same thing can be said about the company’s vision, that should probably precede the mission. I think this storyline can be used for the overall strategy of the company, but also for different sub-strategies, e.g. on a specific product or service. It provides some context and relevance to what we are doing, which I think is neccessary for people to buy in to it. 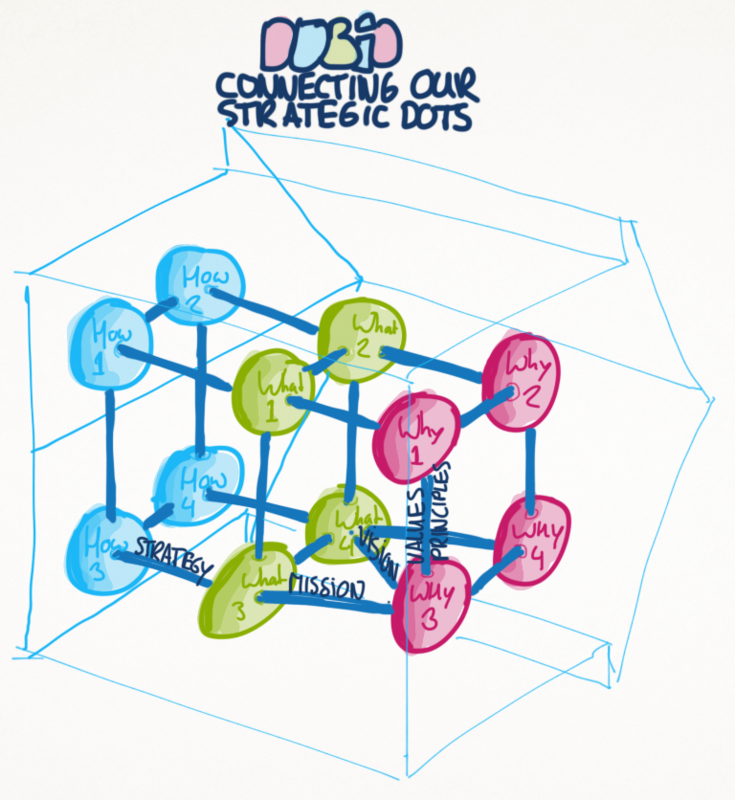 That said, I feel there are more ways to ‘connect our strategic dots’. For one, there still is a disconnect between most of the ‘future dots’ and ‘current dots’, and maybe we should include some historycal background as well (see next post). Q: What do you think of the concept of a strategic storyline?